Reconditioned product, with full 90 days warranty. Packed with all accessories and operating manual. Shave in or out of the shower. NIVEA for Men shaving lotion and gel leave your face feeling smooth and refreshed. Lotion and gel are vitamin enriched to moisturize, and the alcohol-free formulas will not dry or irritate the skin. Indicates battery level, when battery is low, full or needs recharging, when to replace/clean the heads, and when to use lotion/gel. Also features demo mode and travel lock. The Norelco Cool Skin Razor redefines the way you shave. Its unique combination of Improved Lift and Cut® technology with NIVEA for Men shaving lotion guarantees a closer, smoother, more refreshing shave with less irritation. Unique Glide Rings are specially designed to evenly spread and hold lotion in contact with skin longer for a smoother, more comfortable shave. Dual blade system gently lifts hair to cut below skin level. 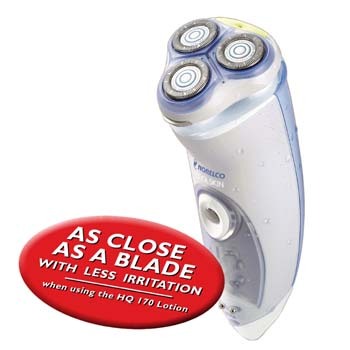 Adjusts to every curve on your face for flexible, smoother shaving. Align the razor-sharp blades closer to your skin for exceptional closeness. Raised head design allows for easy flow through cleaning under faucet. Simply rinse razor under faucet after each use for easy cleaning. For convenient handling in or out of the shower.